The Animated Woman: New baby. I miss having a new baby. Part of surfing midlife is leaving all that behind, I guess, but I still remember how much fun it was. My nose was always buried in them, I was always breathing them in, always gazing at them, as if I could somehow freeze time and live in a perfect moment forever. I felt like I could never get enough of them. 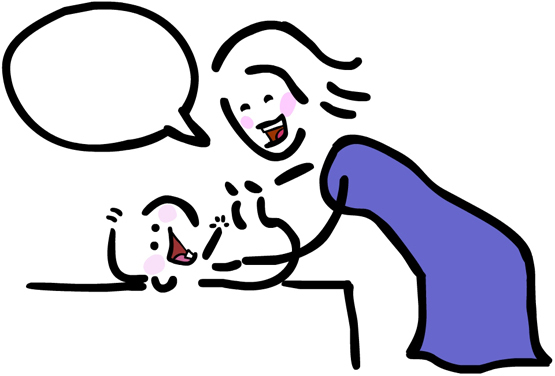 What were your most precious moments with your new baby? These drawings first appeared on World Moms Blog. I do not have any children but I did raise my baby sister (we are 18 years apart) due to an absent mother. My precious moments were when she would lay her head on my shoulder as I carry her, she would "shove" and snuggle her little face in my neck as she falls asleep. Note that my neck is an extreme tickle zone for me and the torture was well worth the drool she left. I'm still my mom's baby! My mom too. She still calls me Bunny. Originally, we planned on having only two children. But, as they grew older I missed having a baby around so much! That is why Kathleen Rose was born when I was 39. I had a lovely little surprise around that time too. Holding her. During my maternity leave hubby always asked when he came home, What'd you do today?" I always replied, "Held the baby." Far as I was concerned wasn't a single thing more important than that. Got so I could chop a cucumber one-handed ... never quite mastered the one-handed onion chopping. It's amazing what you can do with one hand. I love everything in the world about babies (although with the middle one the constant night wakings and lack of sleep, unless laying on me in her *just so* position, for over 3 years was a bit REALLY taxing on me). But, if I had to pick just one thing it would have to be the excitement and happiness they exude at everything new to them and everything new they learn how to do. Just pure unbridled joy. My youngest just learned that if he exhales as someone is 'tapping' over his partially open mouth he can make a "ah, ah, ah" noise ...yeah, typing that out just doesn't work well... but it totally excites him and then a giggle escapes from his throat, which then surprises him and he gets all wide eyed and almost frightened looking. Which elicits a laugh from me and he goes back to it. My other favorite part of having an itty bitty is his interaction with his PawPaw. PawPaw is the one who taught him the "ah, ah, ah" Indian battle call, so now every time he hears his PawPaw's voice, even over the phone, the first thing he does is open his mouth and say "ahhhhhhhhh" waiting for someone to tap so it will break up. Oh man...now I'm all blubbery. I so greatly am in utter love with getting to do it all over again...totally don't know what I'm going to do when he starts Kindergarten though - if the tubal ligation holds then I won't be again unexpectedly expecting during his kindergarten year, so I might actually get to be quite regular with volunteering. But my oldest will be graduating high school that year...and all the feels all over again.